This study is aiming at controlling the microstructure of plasma sprayed Al2O3-TiO2 composite coatings using freeze granulated powders. As sprayed and sintered Al2O3 + 3wt% TiO2 powders were air plasma sprayed with industry process parameters and compared with a commercial powder. 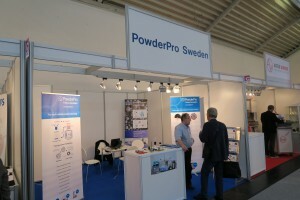 The resulting coatings were investigated with respect to powder flowability, porosity and microstructure of the granules. The results showed that microstructure and melting fraction in the coatings could be tailored with the freeze granulation process and heat treatment conditions. Welcome to our stand No 10 at the 15th Conference & Exhibition of the European Ceramic Society ECerS2017 July 9-13, 2017 in Budapest, Hungary. We look forward meeting with you and to discuss how we could support you with Freeze Granulation of your powder material for to make homogeneous granules for the manufacturing of high quality ceramics. 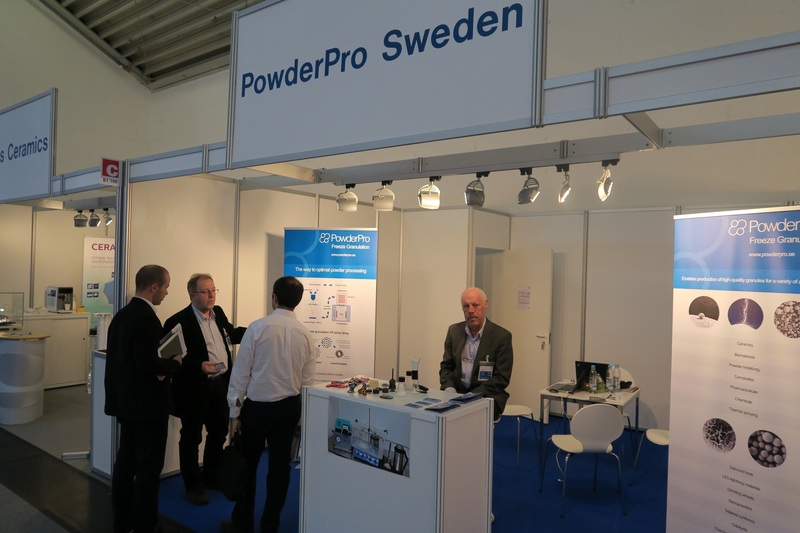 We would like to thank all visitors for interesting discussion at our stand at the Ceramics Expo 2017. 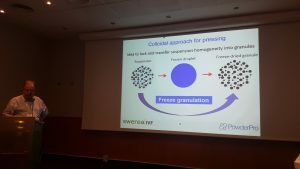 Here Kent explain the benifit of Freeze Granulation how to make spherical and homogeneous granules for pressing. The aim of this work has been to obtain transparent Tm, Ho:YAG ceramics (thulium doping range: 2–6 at.%, holmium doping range: 0.1–1.0 at.%) by reaction sintering using commercial powders. It has been proved that the particle size, purity and degree of agglomeration of the powders used are crucial from the point of view of the optical quality of ceramics. The spectroscopic measurements of Tm, Ho:YAG ceramics with different concentration of active ions (including transmission and emission spectra measurements) have been presented and discussed. As has been found, both concentration of holmium and thulium separately as well as the balance between them are of great importance. Energy transfer between Tm and Ho ions has been demonstrated. Yttrium aluminum garnet, Transparent ceramic, Tm, Ho:YAG, Freeze Granulation, Reactive sintering. Second day at CERAMITEC 2015 on Oct 21th with good discussions upon processing of different powder material by Freeze Granulation and the advantages regarding granule homogeneity and the impact on the ultimate material performance it brings. Granulation, the process of particle enlargement by agglomeration technique, is one of the most significant unit operations in the production of pharmaceutical dosage forms, mostly tablets and capsules. Granulation process transforms fine powders into free-flowing, dustfree granules that are easy to compress. Nevertheless, granulation poses numerous challenges due to high quality requirement of the formed granules in terms of content uniformity and physicochemical properties such as granule size, bulk density, porosity, hardness, moisture, compressibility, etc. together with physical and chemical stability of the drug. Granulation process can be divided into two types: wet granulation that utilize a liquid in the process and dry granulation that requires no liquid. 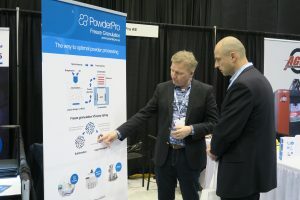 The type of process selection requires thorough knowledge of physicochemical properties of the drug, excipients, required flow and release properties, to name a few. Among currently available technologies, spray drying, roller compaction, high shear mixing, and fluid bed granulation are worth of note. Like any other scientific field, pharmaceutical granulation technology also continues to change, and arrival of novel and innovative technologies are inevitable. This review focuses on the recent progress in the granulation techniques and technologies such as pneumatic dry granulation, reverse wet granulation, steam granulation, moisture-activated dry granulation, thermal adhesion granulation, freeze granulation, and foamed binder or foam granulation. This review gives an overview of these with a short description about each development along with its significance and limitations. Please contact us and we will further discuss the opportunities with Freeze Granulation in your powder system and read more on technology. 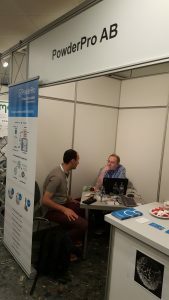 Recently, enormous efforts have been done within the development of Li-ion batteries for use in portable electric devices from small scale applications such as mobile phones, digital cameras, laptop computers, to large scale applications like electrical vehicles (EVs) and hybrid electric vehicles (HEVs). LiFePO4 as an active material in cathode materials in Li-ion batteries has shown outstanding advantages compare to other cathode materials such as low cost, low toxicity and environmental compatibility, good thermal stability, high theoretical specific capacity of 170 mAh/g and operating reversibility at 3.4V. Still, it is a need to develop the manufacture of the cathode material to achieve improved performance reliability by using environmental sustainable processes in order to meet future demands in large scale production and uses of Li-ion batteries. The aim of this work was to develop a non-toxic, cheap, efficient and environmentally friendly process for synthesis of high quality active cathode material based on LiFePO4 for Li-ion batteries. Water based suspensions/solutions containing various reactant constituents have been homogenized, granulated and calcined. 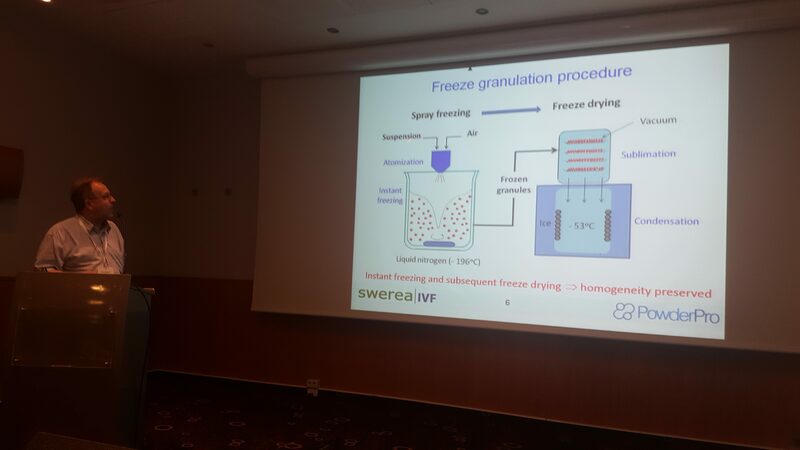 Freeze granulation was applied as the key tool for the synthesis of LiFePO4 with integrated carbon in order to produce granules with high degree of homogeneity prior to calcination. 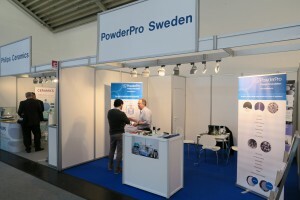 The resulting powder materials have been evaluated by XRD, carbon and conductivity measurements and characterization of other physical properties such as density and specific surface area. The promising version was used for manufacture of cathode material by tape casting, cell assembling and evaluation of the performance by charge/discharge cycling of the cells. For the best sample in our experiment the XRD results revealed a high degree of purity, homogeneity and crystallinity of LiFePO4. The produced LiFePO4/C composite also had a high specific surface area and, therefore, considered as a promising material for cathode manufacturing and cell assembly. A discharge capacity of 155 and 140 mAh/g was achieved at the fifth cycle at 0.1C rate at room temperature for the cathodes which were made with NMP (solvent based) and water system, respectively. The long-term stability test indicated good result with no loss in capacity for at least 390 cycles. The satisfactory discharge capacity should be attributed to the homogenous nano-sized particles with a conductive porous carbon structure that was provided by the freeze granulation process and adapted calcination process. granulation, calcination, LiFePO4/C composite, cell assembly.